IN NIB BINS BINDS SINBAD DISBAND SIDEBAND etc. 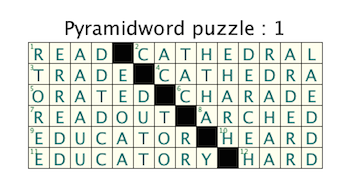 A clue accompanies each word so that the puzzle can be solved in the same way as a crossword puzzle. 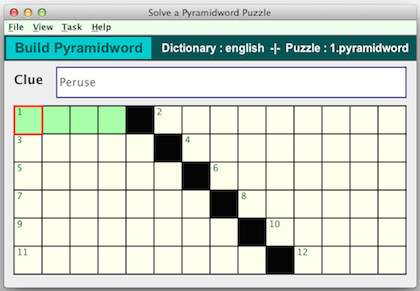 These graphics show a Pyramidword puzzle in the Crossword Express Solve screen and a PNG graphic file produced by the program's print function, showing the complete puzzle solution. See also a full size version of a PDF file.